It appears that the Kapoors will celebrate Diwali in London this year. 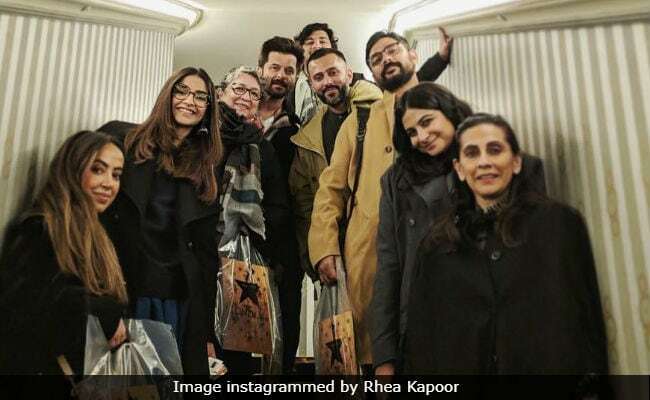 Actor Anil Kapoor and his wife Sunita are in London along with their daughters Sonam and Rhea, son-in-law Anand Ahuja, and Karan Boolani, who is reportedly dating Rhea Kapoor. Rhea, who attended Abu Jani-Sandeep Khosla's Diwali party earlier this week, Instagrammed pictures from the group's recent visit to the Victoria Palace Theatre in London. They all looked ecstatic as they posed with similar goodie bags from the popular London spot. Sonam and Anand, who got married earlier this year, frequently travel to London and they also reportedly own a home there. It seems, Anil Kapoor's son Harshvardhan skipped this trip to London. Harshvardhan was last seen in Bhavesh Joshi Superhero and he's currently busy with the biopic on Abhinav Bindra. After the family vacation, the Kapoors are expected to get back to making films. Sonam Kapoor's work-in-progress films are The Zoya Factor, co-starring Dulquer Salmaan, and Ek Ladki Ko Dekha Toh Aisa Laga, which also features her father Anil Kapoor and actress Juhi Chawla along with Rajkummar Rao. She was last seen in Sanju and before that in Veere Di Wedding, which release shortly after her wedding. This year, Anil Kapoor was seen in Race 3 and then in Fanney Khan. Apart from the aforementioned Ek Ladki Ko Dekha Toh Aisa Laga, Anil Kapoor has signed up for Total Dhamaal, co-starring Madhuri Dixit and Ajay Devgn. Anil Kapoor also plays his son Harshvardhan's onscreen father in the biopic on Abhinav Bindra.